The Biore Deep Cleansing Pore Strips are the best tool for unclogging nose pores. Oil and dirt are acne sufferers number one enemy. The combination of the two is what create those terrible looking blackheads. Because of the structure of our nose blackheads are more prevalent and noticiable there. Of course with clogged pores on your nose blackheads aren’t only a visually aunappeling issue, they may also lead to a pimple being formed, so now you have clogged black pores and a red bump on your nose. Well this product is a simple solution to avoid all of that. This strip works by sticking to your nose and grabbing all that dirt and oil clogging your pores, what you get once you remove the strip is a clean and clear nose with no dirt, oil, blackheads and eliminating the possibilty of a big red pimple forming. These strips are a simple fast solution to avoid bigger skin issues down the line. 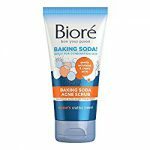 The Biore Pore strips are one of the more popular strips for blackheads and dirt, but not because of fancy marketing campaings, they really work and are a great treatment to keep your nose pores unclogged. The application is easy, fast and effective. Just apply it, let dry and remove, you only have to do it once or twice a week or even only once in a while, results are inmediate. Biore is a trusted brand with a huge number of reviews and positive feedback. Wash and clean your face completely, the most important thing is to open up your pores as much as possible, this can be done by washing your face with hot water by splashing it on your face for a minute. You can also use a hot towel and leave it on your face for five minutes or you can use an acne wash that exfoliates, mostly Salicylic acid based products. Once ready, wet your nose (this is important), with your dry hands remove the clear plastic and apply it with the smooth side down. Press down all surfaces of the strip to ensure good contact. After application wait 10 to 15 minutes or until the strip becomes stiff to the touch. Once dry, try to remove it in a single pull from one side to the other, you might feel a little pain not only from removing dirt from your pores, but only pulling little hairs on your nose, but nothing too bad. Once removed, apply your favorite acne treatment to your face or simply wash with cold water to close up your pores. Do not use it if you already have a pimple on your nose or a cut. Your nose might turn red from the pulling, so it is best to do this at night. Also, so you do not expose your newly opened pores to new dirt so fast. You can use it once or twice a week or even once a month if it is not as bad and you have other products to help reduce acne. Redness and dryness might occur, for this reason it is always recommended to use the great moisturizer mentioned on the Red/Dry skin page. Make sure to use it after use during the day since it has SPF 30 protection too. Like with many products, try it multiple times, if you notice no difference then the product might not be for you, do not get discouraged if you see little results right away, skin clearing is a process that takes time and patience and needs to be tested, do not give up. Of course this is said in general for skin care products, but for these strips you should be able to see the results you want right away. If you want more tips, tricks and information on other great products you can always check out the Acne, Scars pages and the Red/Dry Skin page which also covers other issues like wrinkles. Take a look at the Biore Pore Strips over at Amazon, this amazing product wiil give you the results you seek right away. Removing blackheads, dirt, oil and preventing pimples on your nose has never been so easy to do. With only a few minutes a week you too can have a more beautiful skin and nose. The reviews show that it works and the simplicity of the product makes very accessible to anyone, isn’t time to get rid of those awful blackheads? If you have any questions or comments don’t hesitate to ask and i’m certain this product will help on your path to a Beautiful Clear Skin. Exactly! the beauty of these strips is how simple, inexpensive and and non-damaging they are to the skin. It is exactly as you described, you get to see the little cones of dirt being stuck to the strip. Why pay hundreds in facials to get your pores cleaned out when you can do this for a fraction of the price? thanks for reading. Do you think putting some sort of antiseptic cream or oil on as an after treatment would help as well? I have an aloe vera plant, and I was thinking of putting some of that one after I do a treatment. Great review and awesome tips! I didn’t know how to prep or do after care after using this product. And now I do! It’s not as bad as it sounds or looks, it is just dirt that got stuck on your pores, so nothing too ugly for you to see. You can certainly add the aloe vera to help relieve any redness, but nothing oily because you might clog your pores again. Overall you do not really have to add anything if you don’t want to once you’re done. My pleasure! I like to give out tips and tricks to make things smoother for people when using the products, thanks for reading. I always have these ugly blackheads on my nose. Seems like these strips are just what I needed. Will the blackheads completely disappear with just one application, or do I need to do several applications in one day? And how long does it take till they come back? Thank you very much, looking forward to hear back from you. All you need is one strip to completely remove all that dirt. It will usually take two weeks to a month to notice blackheads again on your nose, so they really do go a long way, hope you like them, thanks for reading. skincare can be a big challenge especially when it comes to choice of products, thank you for the Biore strips to help with a problem that is quite common, i personally do not have a big problem with acne and general breakouts but my daughter has lots of facial skin issues and i think this product may help.it reviews highly and will recommend it to my daughter. most skin strips i have tried before have the tendency of irritating the skin and stripping it of oil thereby causing another problem,do these leave the skin dry? and how big is the unit? thank for the help you are offering us here. Completely true, they do not leave the skin dry nor they are irritating or cause any problems for the skin. They will cover your entire nose just fine since they are big enough. I hope they help your daughter, thanks for reading. Squeezing pimples is difficult as it is, squeezing blackheads is worse. These strips are a great painless way to remove all that dirt. By pinching your skin too hard, you can end up causing damage to it. Solutions like these strips for your nose or a Salicylic Acid product which is great to exfoliate your whole face are the best answers to clogged pores, hope they help, thanks for reading.